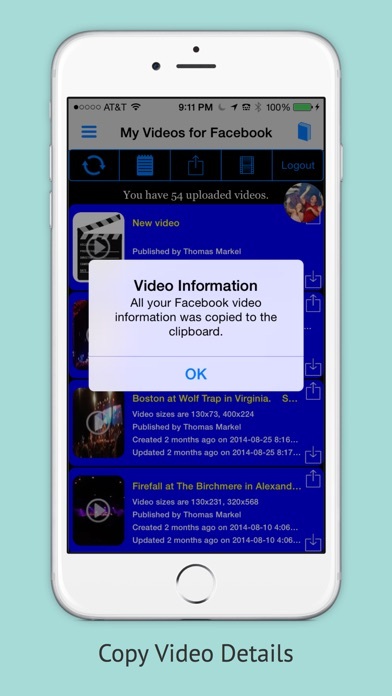 Easy access to all your uploaded Facebook videos. Play, download, record and upload or share. 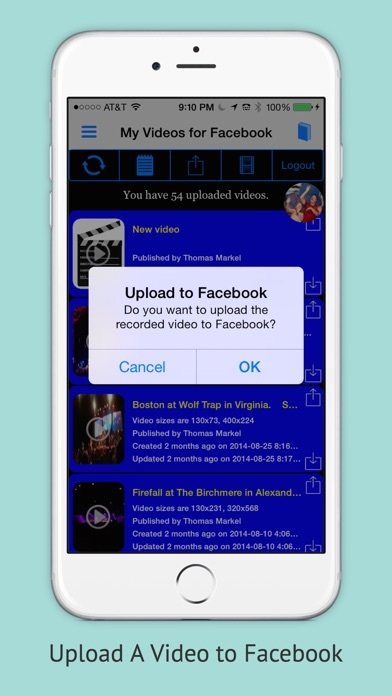 Record and upload a new video to Facebook. 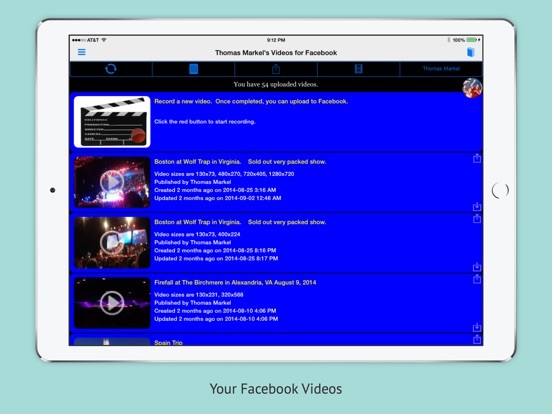 Play any video directly from Facebook. Download any of your Facebook video, save to your photos camera roll and watch video offline. Indicates new videos you have uploaded. You can also record a new video and upload to Facebook, upload a video in your Photo Camera Roll to Facebook or play any video in your Photos Camera Roll. Downloads videos from Facebook to your gallery or to your SD card, you can watch them later when there is no Internet connection. The first entry listed has a red record button and is used to record, play and upload a video to Facebook. Each video listing shows details about when the video sizes, when the video was published, when the video was created and when the video was last updated. New videos within the last week are shown with a new icon. Once you login to your Facebook account, you are provided instant access to all your uploaded videos with details and a thumbnail of each video. To play the video, click on the associated video play icon. When playing your videos are streamed. If you want a local copy of the video then use the download capability (see below). To copy the list of videos to the clipboard, click Copy note icon. To download a Facebook video and save to your Camera Roll, click the download down arrow icon. The built-in download manager ensures easy downloading of any size video. 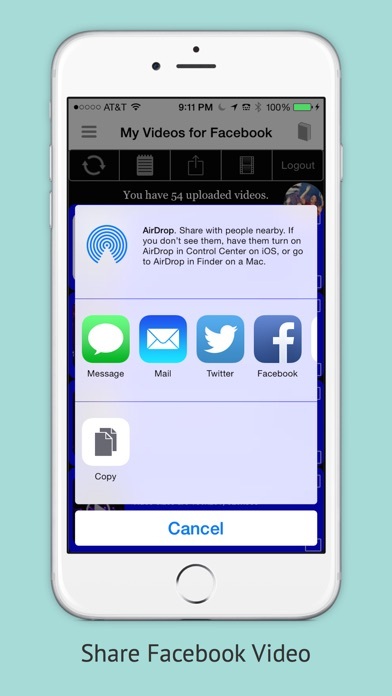 To share the list of videos, click the Share up arrow icon. 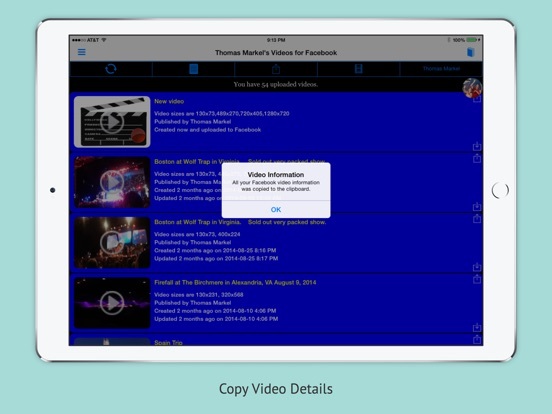 Sharing provides video details and links to the videos on Facebook. To play any of your local videos saved in Photos, click the Other Videos film strip icon. The other video can be played or uploaded to Facebook.